Should we find activity, we'll detail the extent of the current damage (if any), and then work with you on destroying the colonies and protecting your property. To arrange for an inspection, click here. 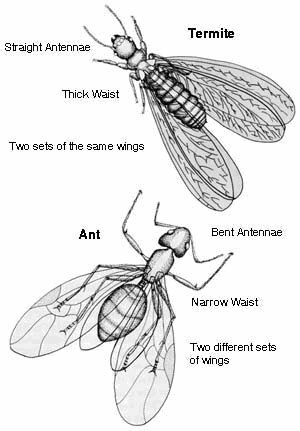 On the off chance you do see them, remember that it's easy to confuse termites with ants. Fortunately, there are features that distinguish them. 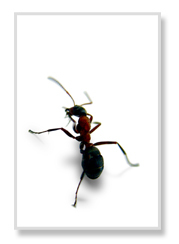 Have you found termite damage to your home? First…don’t panic! If your home does have termites, they didn’t get there overnight and they’re not going to take your home down overnight, either! Second…you’ve come to the right place! We’ve become the area’s leading provider of termite control and prevention and we’ll put our thoroughness and expertise to work for you! We pre-treat the post holes before the concrete is poured and then we’ll return later to treat the perimeter’s underpinning with Termidor®. If the holes are already set, we can still treat this but it does require that all of the posts be trenched and treated, resulting in a lengthier job, but nonetheless, just as effective.